EAST LANSING- All major news outlets in Michigan have covered the controversial effort to shut down all testing facilities, processors, cultivation centers and dispensaries in the state, which was announced during the October 21 meeting of the Licensing Board for the Medical Marihuana Facilities Licensing Act. The video of that meeting is now public. In it you will see one Board member consistently push a single-minded agenda- to enforce a policy of eliminating the existing medical marijuana business community in Michigan, either by direct shutdown or by discriminatory exclusion in the application process. In truth, the Board did not authorize either of the proposals made by former Michigan State Police sergeant Donald Bailey. His move to order the Board to “shut down” or disqualify all dispensaries open after September 5 was put off until the next meeting, and David LaMontaine’s ordering of LARA to produce a master list of all businesses operating across the state in the patient services industry- complete with owner’s list- was essentially dismissed by Director Andrew Brisbo of the Bureau of Medical Marihuana Regulation. Some of the comments made by activists and Board members during the October 21 meeting are noteworthy. You can read some quotes at the companion article, which is HERE. The oddity of this statement was noted by the attendees. Here’s a former law enforcement officer who chooses to attack dispensaries because they create an unfair business environment- not because they are a threat to their communities, or because they are supplying illegal drugs or making it easier for minors to get marijuana. No allegations of criminal behavior, just a need to be “fair” to as-yet unnamed businesspersons from Michigan. “It’s a four-and-a-half year old decision from the Supreme Court. This is very clear,” he added later. “So, anybody who is a dispensary currently has until Labor Day to close their doors if they intend to apply for a license under the Facilities Licensing Act.” He later decided that it made sense to do this the day after the holiday, September 5th. Board member Vivian Pickard voiced support for the drop-dead deadline, and asked to extend the shutdown date for “a couple more weeks”. David LaMontaine asked that the Board wait to vote on the issue until there was more clarity; the motion was tabled by unanimous vote. Discussion of a meeting by the Board in September received general agreement. 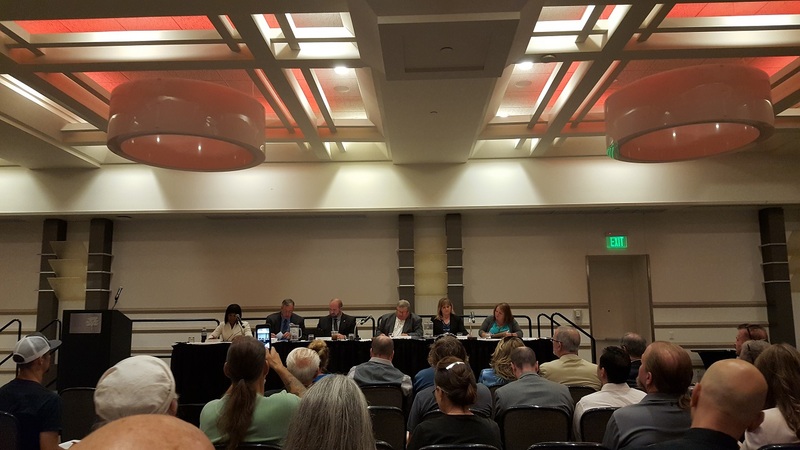 After the Public Comment portion of the meeting was concluded, Rick Johnson revisited the motion on the closure of all dispensaries, testing labs, processors and cultivation facilities in the state. Bailey not only attacked the message given to him by the 200 attendees, he took a shot at the messengers, too. “We’ve heard from a number of activists today. These are the same activists that I see on social media promoting recreational abuse of this medical marijuana. We’ve heard from them today.” The crowd reacted negatively, despite the fact that it his remarks came at the end of the hours-long session and the audience was whittled down to a fraction of its largest size. “For many of the folks, I watch what they do, and it doesn’t line up with what they said here today,” Bailey said, of the people who testified. 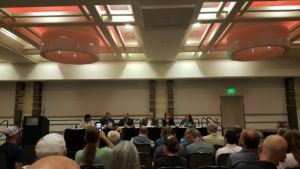 LaMontaine referenced the workgroups described earlier as a way for the medical marijuana community to participate in this process. When Bailey’s proposed shutdown of all businesses in Michigan handling cannabis, she was a strong voice. Bailey continued to argue his point on distribution centers. “These dispensaries were never legal,” he railed. Despite Pickard’s recommendation to postpone the vote, Bailey tried to force the Board to do just that. As they discussed voting on the proposal, Chairman Rick Johnson sided with Don Bailey on the issue. “I agree with Don, they are illegal…” he began. The meeting concluded without a vote on the proposal, but with a promise of a meeting in September when the full Board can make that decision. You can view the full video (saved in two parts) by clicking HERE. Bailey’s opening comments come at approx. 11 minutes into the recording. Do a criminal background check, exactly like what it takes to qualify as a caregiver, and that is that. As much as I dislike people who bust bigger moves than I do getting away with it, they got away with it. Law enforcement can't just point fingers. They have to gather evidence and make a case. Take that to court and win. Then they have a felony conviction and those people don't qualify to legally supply anyone with medical marijuana. Those are the rules. So sit down and shut up with this slander Michigan State Police whatever Bailey. “This is a pain in the kiester”. Bailey even talks like Archie Bunker. “The bottom line is, it is fundamentally unfair to those (businesses)… that are abiding by the law by not opening. " If they haven't opened they don't exist. what a making whoopee retard. Quick question. This particular Licensing Board is only dealing with potential MMJ businesses, correct? They are not the same board that qualifies new conditions, right? correct, different board entirely. the new condition board has mostly physicians + a patient advocate. the MMFLA board is a weird mix of police and business managers and a pharmacist. Rick Johnson of LeRoy, who also will serve as chair. He manages Common Cents Farm in LeRoy. Johnson was a state representative from 1998–2004, serving his last four years as Speaker of the House. Johnson holds an honorary doctorate of public service from Ferris State University. David LaMontaine of Monroe. He is a business agent and executive board member for the Police Officers’ Association of Michigan. LaMontaine previously served in the United States Marine Corps, as a police officer in Hamtramck, and as a hostage negotiator and detective for the Monroe County Sheriff’s Office. LaMontaine studied employment and labor relations at Wayne State University. Vivian Pickard of Bloomfield Hills is the president and CEO of The Pickard Group consulting firm. She recently retired as director of public policy for General Motors and served six years as president of the General Motors Foundation, during which she managed all the company’s U.S. philanthropic donations. Pickard holds a bachelor’s degree in human services management from Ferris State University and a master’s degree in business administration from Central Michigan University. What do you think motivates someone like Bailey, who so obviously hates cannabis, to become a licensing board member for the very product they loathe? in my opinion, same as all other board members (well not the qualifying conditions board) in this corrupt state. get bribes from stakeholders, delay implementation as long as possible. get bribes from pharma/prisons for delaying/restricting. give licenses to friends and family (e.g. make more money). give license to people who will then bribe with a job after the appointment time is up-- just more money. i dont think caring about patients is on the list. the list of reasons people are on the board is: money money money money money money and money and power. no one will get a licence unless the have tons of $$$$$$$ or are a friend. so i guess the same thing. i doubt licenses will be transferable . that would cut into the application fees.